Grows on the Ground, in the woods. Many many Russulas fit this description. Best determined by smell, taste, staining, spore print and other characters. Russula Xerampelina (Shrimp Russula) is one of the edible complexes has Yellow to Orange spores, smells like shrimp or fishlike in older or drying specimens. It has varying color sometimes with a reddish pink stalk. It has mild taste. It stains brown when nicked or rubbed. Russula Emetica (Sickener) is poisonous, has a white spore print, and has a strong peppery taste. Mushrooms in the Russula genus are very brittle and have white to yellow to orange spore prints. The ones with a white spore prints and acrid taste are generally poisonous. 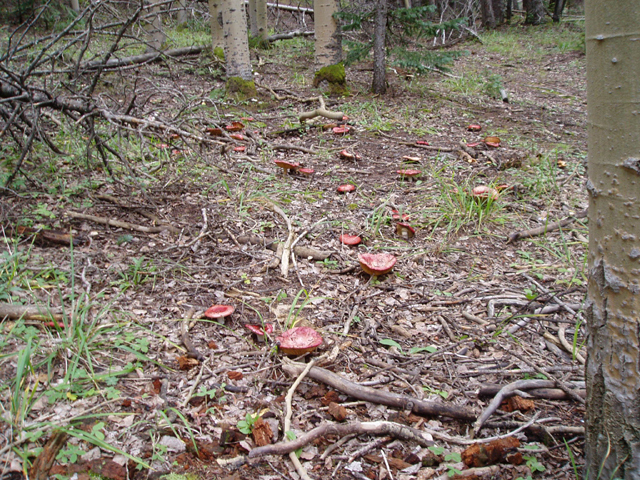 For more information about the Russula Genus click here.